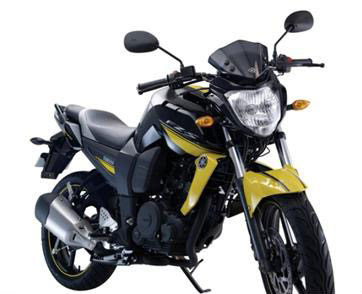 the Yamaha FZ-S - The Stylish Lord of the Street (as Yamaha India is calling it). 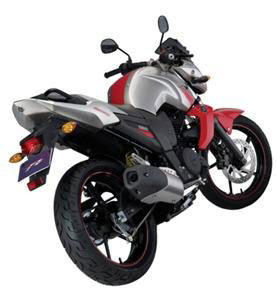 Going on the lines of the other Indian players in the market, Yamaha India has done some stickering and coloring job on the FZ-16 to give us the FZ-S. No new technology or any engine upgrade. I'm not sure how it would look in flesh and bones, but some how I'm feeling the tinted visor is playing a sore eye over here, making it look rather feminine instead of flaunting it's Triple Macho concept. I haven't seen the bike in flesh yet!! but somehow I didn't liked the visor design!! But I totally agree that in flesh the bike might look better coz even I liked the color scheme of the bike. why do all bike manufacturers start this kind of silly paint jobs? its looking girlish!! I'll be seriously diappointed if the P180/200 upgrades too eventually turn out to be silly paint jobs! !